Increasing your support as a member means increased benefits and recognition as a waste diversion champion in Missouri! 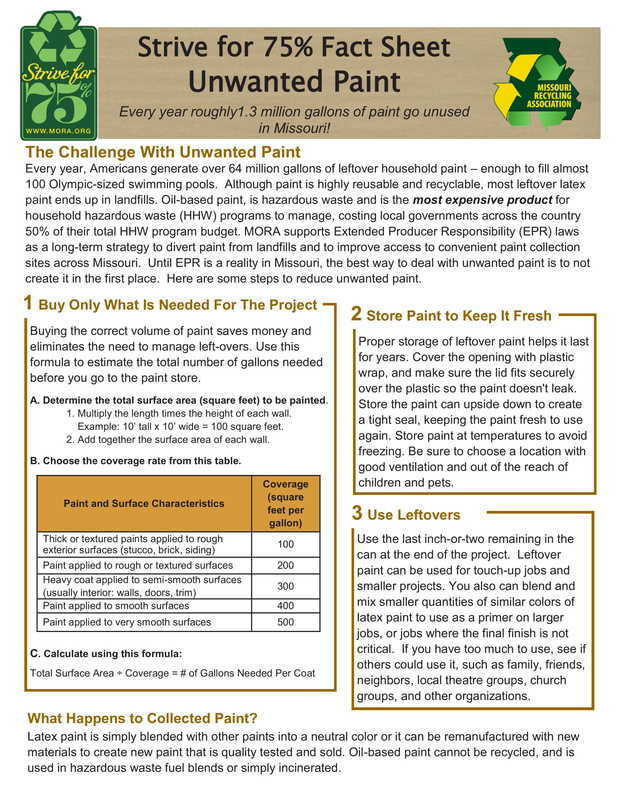 Help Missouri Set a New 75% Waste Diversion Goal! Here are some quick facts to help explain why setting more aggressive diversion targets are important for Missouri to expand our economy, strengthen or communities and improve our environment. The current Missouri waste diversion goal of 40% was set in 1990 and met in 2009. 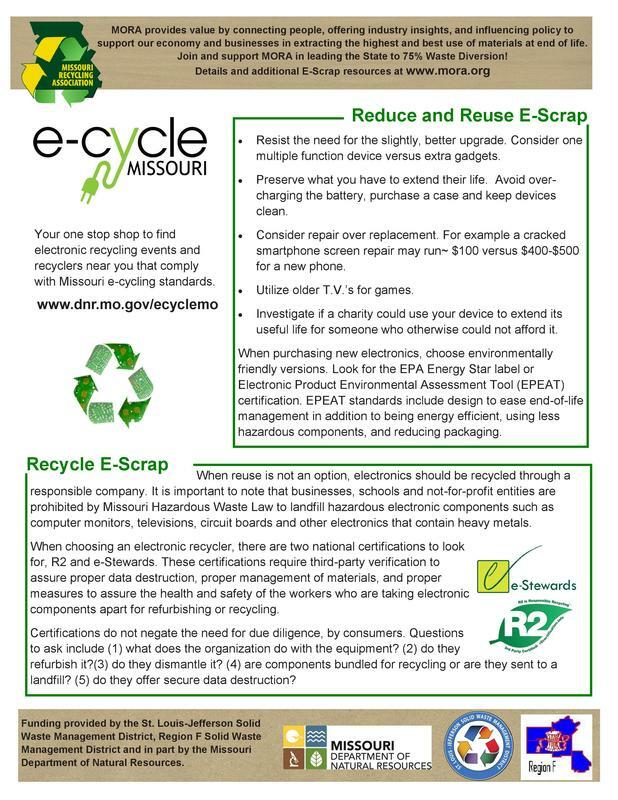 The success of that initiative is outlined in the MORA publication “Recycling in Missouri: A 2013 Progress Report”. Missouri has much more opportunity to build on the success of the 40% goal by recovering the estimated 48% of resources still going to landfills. 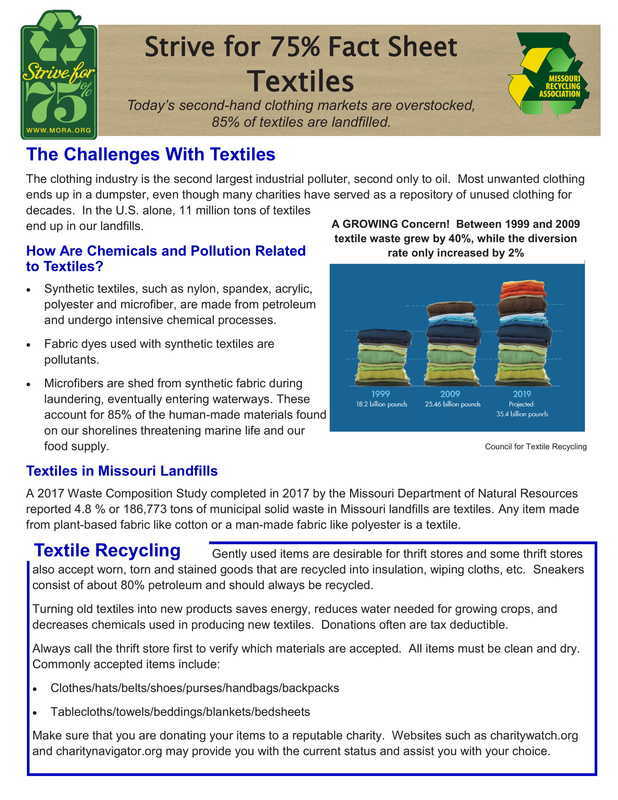 A 2010 Missouri Green Jobs Report states “The conversion, distribution, and sale of recycled raw materials create jobs integral to the green economy.” Landfilling recyclable material is throwing away opportunities for jobs and economic growth. Obtaining raw materials to manufacture new products is increasingly expensive and difficult. 75% diversion saves energy and virgin resources by diverting materials back into the economic loop. Waste diversion and recycling is at the foundation of every Corporate Social Responsibility (CSR) program. To stay competitive and attract companies, Missouri needs to continue to grow the infrastructure to recover more fiber, food waste, plastics, electronics, construction and demolition wastes. 35,000,000 tons of food are wasted every year in the U.S. A 75% waste diversion goal will expand infrastructure and resource to divert food to hungry people. Food not suitable for human consumption can be turned to animal feed, biofuel compost or other beneficial products. A 2001 report by the Tellus Institute with Sound Resource Management states that “Increasing the national waste diversion rate to 75% will significantly and sustainably create 1.5 million additional jobs by 2030. Setting up a lap top for individuals to take the pledge on-line. Printing the pledge card (template available here) and having the attendees complete the form. A small token or give-away is a good idea to thank people for taking the pledge. Another idea is to provide a large prize and the attendees are entered into a drawing for taking the pledge. A basket of recycled content items is a great prize that also illustrates that recyclables are turned into new products! MORA members can request up to 25 business cards to promote Strive for 75% to their contacts and can borrow a pull-up banner to display at events. This is just one benefit to being a MORA member! If you are not a member, please consider joining now to become part of the grassroots effort to move Missouri to 75% Waste Diversion. Become a Member or Click here to reserve banner or business cards. U.S. What if we recycled the materials into Made in Missouri products? afford to waste this opportunity! Join MORA in moving Missouri toward a 75% recycling and waste diversion goal! 1. 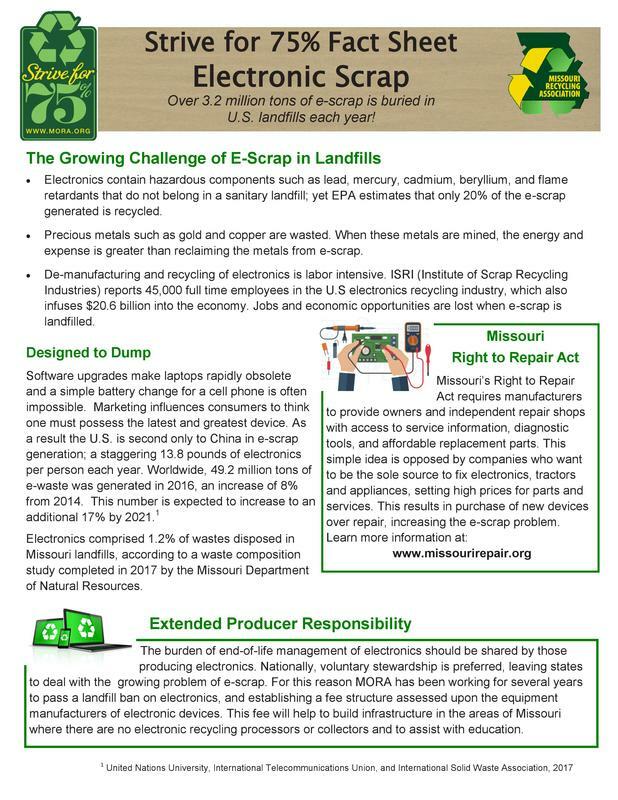 Advance legislation that would significantly increase the recovery of electronics that are now disposed in Missouri landfills. Electronics contain heavy metals that can cause irreversible effects in humans and the environment. Safely recycled, these metals can be used to manufacture new electronics, such as computers and cell phones. Find MORA's E-scrap Page Here. legislative session with support from the recycling and waste industry, local and state government, and environmental organizations. 2. 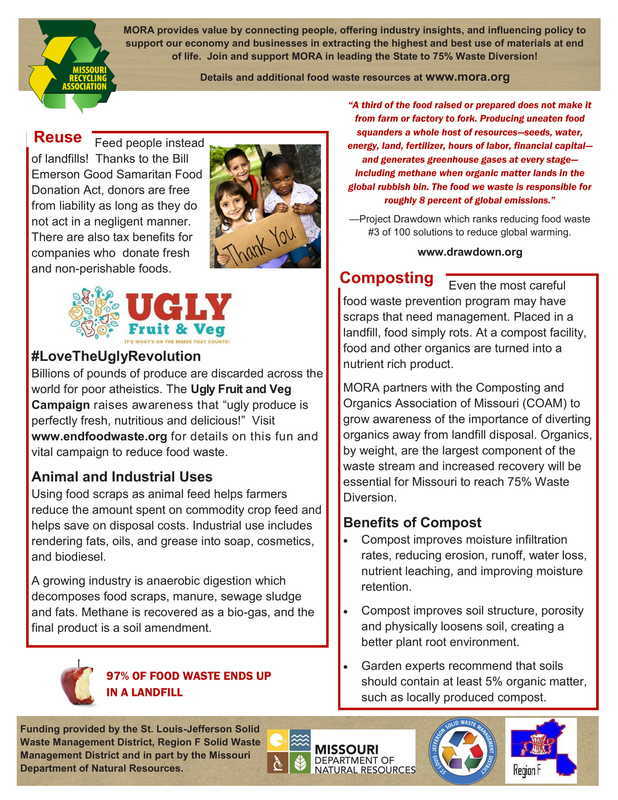 Increase the recycling and beneficial use of organic waste, especially food waste. education, technical assistance and promote organics recycling across the state. Much of the wasted food is perfectly good and could be better used to offset hunger. Food waste that cannot be used for human consumption can be turned into animal feed, biofuel, compost, and other beneficial products. 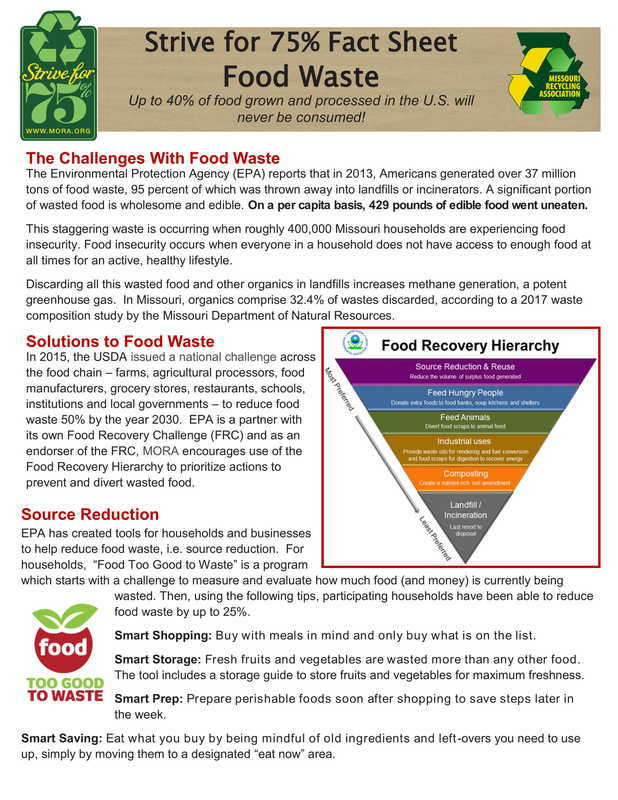 Look for new information on better uses of food waste and end uses of organics located in Missouri on MORA’s website in 2014. 3. Build new markets and methods for recycling construction and demolition (C&D) waste. The construction, renovation, and demolition of buildings, roads, and bridges can create a lot of waste. Disasters like the recent F5 tornadoes create an even larger amount of waste. 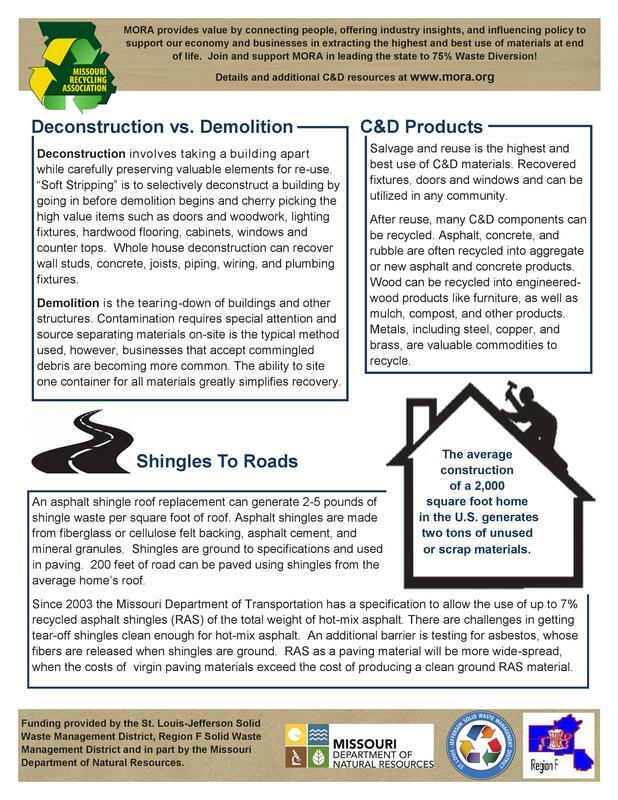 C&D waste includes stone, concrete, brick, wood, metals, glass, shingles, and salvaged building components. Green building requirements and the interest in more sustainable development is opening new markets for these materials. 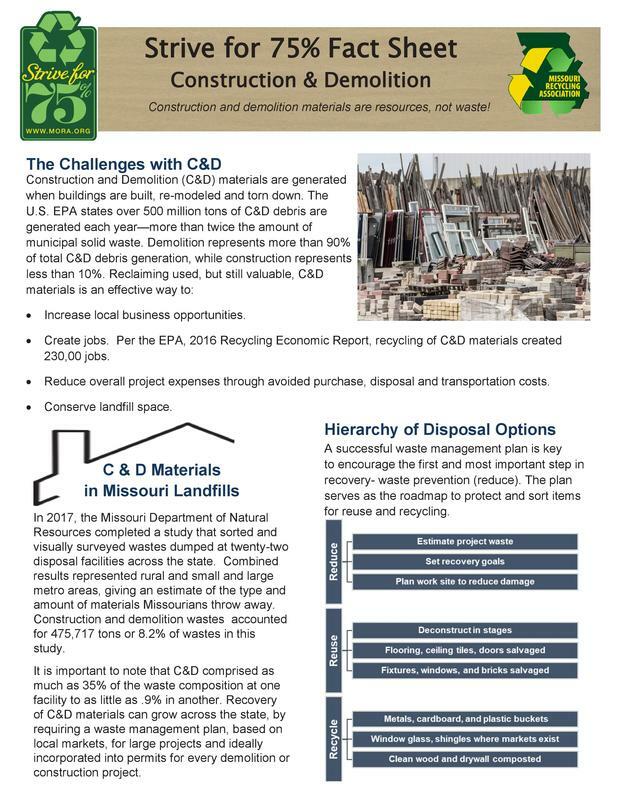 MORA will collaborate with others involved in C&D waste recycling and green building to bring new education and information to Missouri in 2014. MORA members will continue to share best management practices for recycling as part of disaster recovery. 4. Increase recycling at home, schools and universities, and business and government. 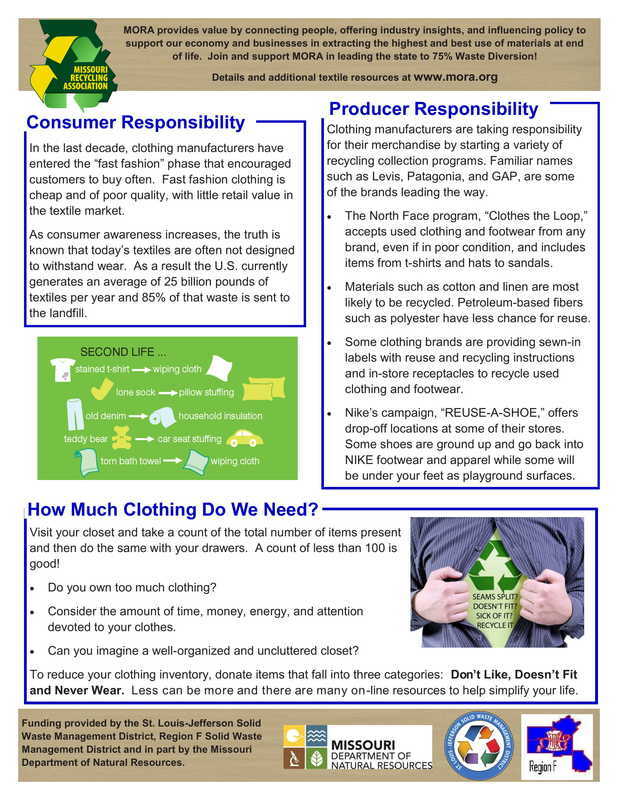 MORA’s new website contains updated information on how and where to recycle a wide variety of items. and compile results on recycling impacts in Missouri. fact sheets for your sector. More Jobs. 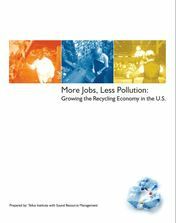 Less Pollution: Growing the Recycling Economy in the U.S.
• Reduction of almost 515 million metric tons of greenhouse gases - equivalent to shutting down about 72 coal power plants or taking 50 million cars off the road. • Significant reductions in air emissions that impact human health and ecosystems. Click on the image to download the free report. A just-released report from the U.S. EPA indicates the 2013 national recycling rate was 34.3 percent, barely budging from 2012's rate of 34.5 percent. According to the annual report, which can be viewed here, the U.S. generated 254.11 million tons of municipal solid waste in 2013 and recovered 87.18 million tons for recycling and composting. MSW generation in 2013 rose by 1.22 percent compared with 2012's generation of 251.04 million tons. Per capita MSW generation also rose a hair in 2013, coming in at 4.40 pounds per person after reaching 4.38 pounds per person in 2012. The paper and paperboard recycling rate in 2013 was 63.3 percent, down from the 2012 rate of 64.6 percent. The glass recycling rate also fell slightly, coming in at 27.3 percent in 2013 after reaching 27.7 percent in 2012. The plastics recycling rate, at 8.8 percent in 2012, rose to 9.2 percent during the most recently reported year. The tone of the EPA report made clear the agency's fresh emphasis on sustainable materials management (SMM), an environmental-assessment approach to materials usage that takes into account a number of factors beyond basic disposal and recovery rates. The report on 2013 figures is titled "Advancing Sustainable Materials Management." Last year's report was called "Municipal Solid Waste Generation, Recycling, and Disposal in the United States." 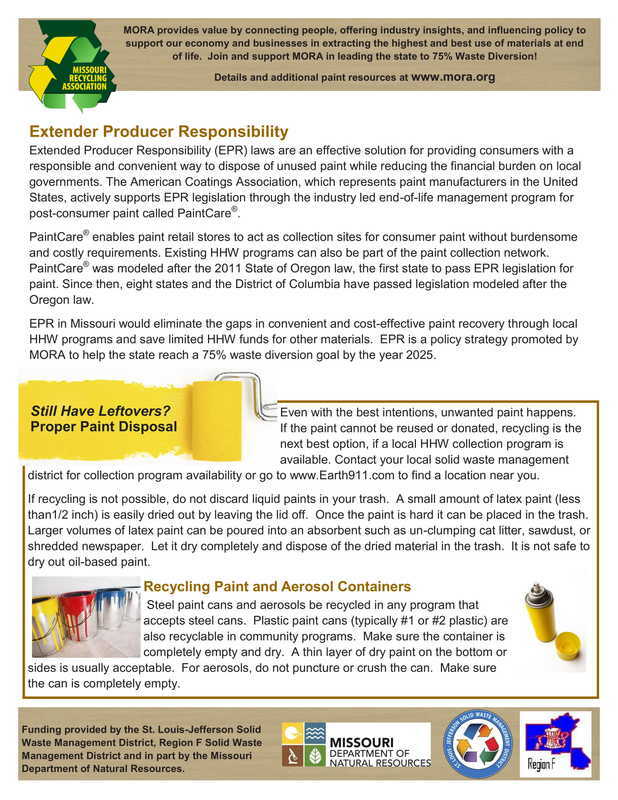 "As the new name for our annual report suggests, EPA is thinking beyond waste," the report's executive summary reads. "SMM refers to the use and reuse of materials in the most productive and sustainable way across their entire life cycle." EPA Municipal Solid Waste Site contains facts and figures and C&D data.